Perhaps one of the most important choices you can make for the health of your fiddle leaf fig plant is where you place it within your home. Your plant needs plenty of sunlight, but not too much strong sunlight on its leaves. Without enough sun, it will grow slowly, be susceptible to illness, and could drop its leaves. When considering how much light to give your fiddle leaf fig plant, remember that they grow in the wild in Africa, where they get tons of light each day. Make sure that you choose a location next to a large window, where your plant will get plenty of light. Many fiddle leaf fig owners don’t think too much about the location of their plant in relation to the sun. They may choose the location based on the design of their home, their furniture, or where they have an empty space. 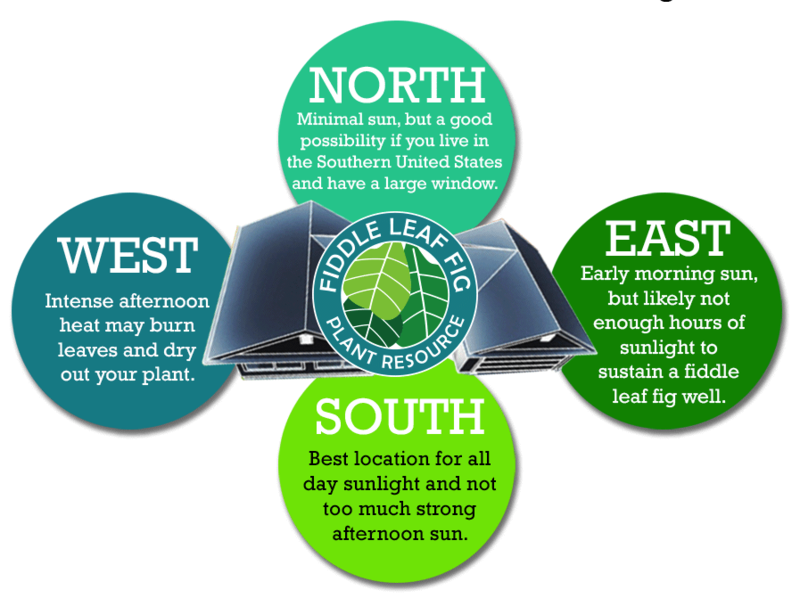 Considering the direction of the sun and how much light your plant will get is important when deciding where to put your fiddle leaf fig. If you’re not sure which direction your home faces, use your phone’s compass app to see which windows face north, south, east, and west. If you’re in North America, the below diagram describes the pros and cons of each direction in your home. North-facing windows often have the least amount of total sunlight and may not provide enough sun for your fiddle leaf fig. This trend is exaggerated if you live farther from the equator. However, if you are in the southern United States, there may be enough light with a large north-facing window. Consider the size of your window and your location relative to the equator. I have a very healthy fiddle leaf fig plant that lives next to a north-facing sliding glass door here in San Diego. East-facing windows have plenty of early morning sun, but little to no afternoon sun, when the rays are stronger. Your fiddle leaf fig needs not only bright sunlight but also more than 6 hours of cumulative duration of sunlight. Because an east-facing window may get fewer than 6 hours of gentle sunlight per day, you may be better off placing your plant in a window with more hours of stronger sun. West-facing windows get intense afternoon sunlight when the sun’s rays are the hottest. This puts your fiddle leaf fig at risk of burning. If you do place your plant in a west-facing window, take care to make sure it doesn’t get too much direct sunlight on its leaves. If you have an overhang on the outside of your window, your plant may be better protected. If not, you may want to pull your plant back a few feet from the window so that it doesn’t get direct sun. South-facing windows get the longest duration of bright sunlight, so they make the ideal home for a fiddle leaf fig plant. Facing south, your plant will likely get over 8 hours per day of bright sun, but few direct harsh rays on its leaves.